The 9 Best Places for Mac and Cheese in Kansas! When it comes to a delicious hearty meal, Kansas does it right. What’s better at filling up your belly than a bowl of mac and cheese? Across the state, upscale eateries and quaint cafes are serving some of the best mac and cheese around. Here are the nine best spots to get it. At the Blue Moose Bar & Grill in Manhattan you can “build your own” favorite “mac-n-cheese” served to you just the way you like it. 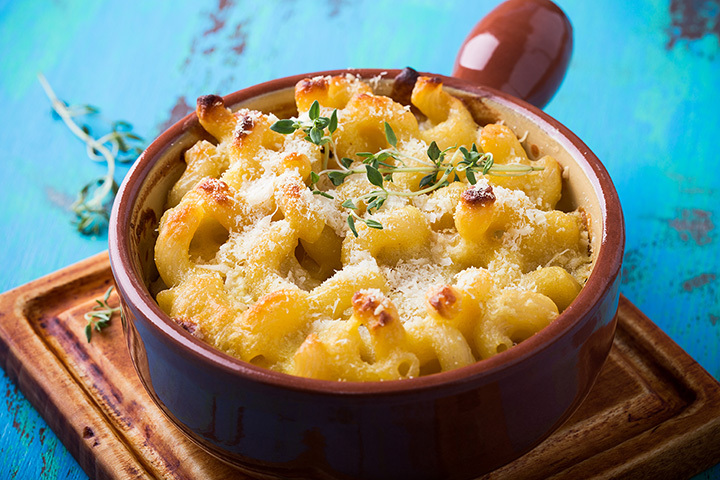 Six cheeses and macaroni are served with garlic bread crumbs on top and lots of options to stuff inside this dish. The 23rd Street Brewery in Lawrence serves a three-cheese shell macaroni dish topped with bread crumbs that is super delicious. And their kid’s menu offers this mac and cheese dish downsized for the kiddos. What better to way to spend the lunch hour than at Watermark Books & Café in Wichita. This place offers a great dish of mac and cheese to enjoy with a great book or any of the over tasty treats. On the “Wood-Fired, Steaks & Chops” menu at J. Gilbert’s in Overland Park you can up-grade your side to the most delicious lobster mac and cheese you will ever taste. If you are looking for the best mac and cheese in Wichita than you must try the kid’s mac and cheese or the adult’s mac and cheese version at the Wine Dive in Wichita. The adult version is served with lobster, shrimp and crab, amazing cheeses all served in a creamy wine sauce and cavatappi pasta, delicious! They serve a lot of good food at Gus’s World Famous Hot & Spicy Fried Chicken in Kansas City and it all tastes better with their famous mac and cheese. You will find it on the main menu and on the kid’s menu. At the River City Brewing Company in Wichita they proudly will tell you, “they don’t serve your momma’s mac and cheese” and they meant it! Instead they serve traditional pasta shells in a homemade creamy cheese sauce topped with toasted bread crumbs, or served over a hand breaded chicken tenders, or with broccoli, or with blue cheese crumbles, or with homemade beer cheese, or with a Kansas hotlink and sweet barbecue sauce. Yum! Old Chicago in Topeka serves up three specialty “mac and cheese” dishes and all three are delicious. You have to try the Beer Brat Mac, the Chicken Pesto Mac or their trademark: Sicilian Pepperoni Roll Mac. This Manhattan donut shop, Varsity Donuts, has a “best kept secret.” On Thursday through Saturday nights from 9 p.m. to 2 a.m. they serve up a great mac and cheese grilled sandwich at the Varsity Donuts’ food truck known as the Varsity Food Truck located in the ally. And yes, you can add bacon!